Formerly known as Wardian cases, moss terrariums are pretty easy to take care of, if they’re put together right. I’ve been making these off and on for years, and have a few well-established ones growing in my house. They’re really nice for times when you want to see some outside nature but for some reason(such as cold or work), you can’t go hiking.Since I moved to Alsea, I’ve spent a lot of time in the woods. I live next to the Siuslaw forest, which is one of the least-developed natural areas in the northwest. It’s gorgeous, silent, and old. The house I live in has its own patch of woods, which is its yard. I spend a lot of my days poking around there, growing things, picking mushrooms, and gathering moss. This is what I do with all that stuff, and it’s not hard to do yourself. substrate- this should be something the moss you will use already grows on. A jar with a firmly-sealing lid or cork. Start with the jar- you’ll need to get your stuff in it somehow. I use a funnel made of paper, and a pair of chopsticks, and a long thin tweezers to do this. If you’re making your first jar, get one with a wide mouth so you can use your fingers! Wash the jar out with only clean water- no soap. wipe the inside dry and clean. Now add your rocks. I use beach agate collected here on the Oregon coast- I try to put only local stuff in my jars, because I’m a dork like that. But you can use any kind of stones or sand or gravel. Make sure if you got them on the beach you wash them off before you jar them- the salts will kill the moss. Actually it’s a good idea to rinse the stones off no matter where you got them. Don’t use any chalky rocks, either. Moss likes acid environments, so you want to avoid chalky stuff. Put a little activated charcoal in. You want a thin layer over the stones- not too much. If you’re working with sphagnum, you can use pine shavings as substrate. Usually potting soil works, just make sure you don’t get any fertilized dirt. You don’t want a lot of dirt. Just enough to even out the surface to a flat state. maybe half an inch to an inch. Now you can add your moss. Get the soil damp with DISTILLED water. Most tap water has lime or calcium in it, which again, will slowly kill your moss. Use distilled water, and only a tiny bit. I use a nonpenetrative syringe to squirt water directly where I want it, but you could use a straw, or an eyedropper. just moisten the substrate a bit. Now put your moss in. folding it in half, and then opening it in the jar usually works. for very small jar openings, you can actually, with some moss, tease it apart into more individual chunks and put those in one at a time. Press the moss down until it springs back up when you let go. Moss is spongy, so don’t mash it totally flat. but you want it to be firmly pressed into the substrate. When you shake the jar it should stay in place. 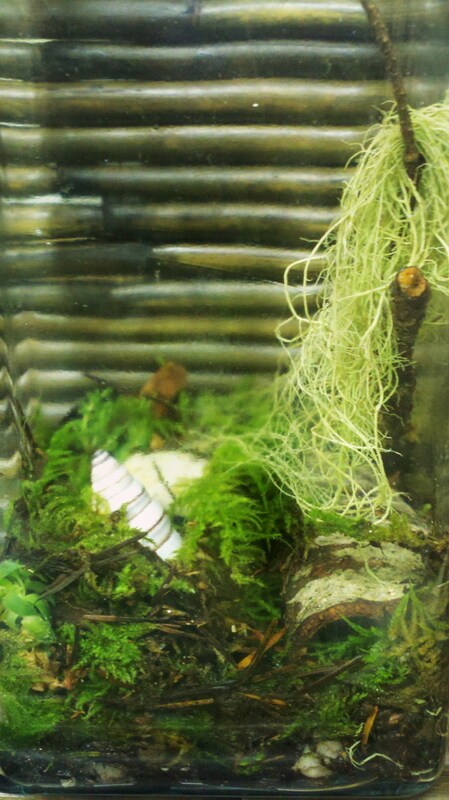 If you want a plain moss jar, you’re done! You can add: hen-and-chicks, which will grow in damp shady conditions, or any other tiny plantlet that was near where the moss was collected. You can usually get away with jade plant cuttings (if they have small leaves) and even clover. Many plants will simply die in the conditions that moss thrives in, so be careful about your choices. Also some plants LOOK small, but when mature will fill the jar! If you want a maintenance-free jar (like the ones I make, which need to be opened only about once a year) don’t use any plants which could potentially take over! I do not put any animals in my jars. I know of ways to do this, but that’s a whole other long explanation. If you are building a vivarium, be sure that the animals can live in more acidic soil environments. Now, since you’re done, get some more distilled water. 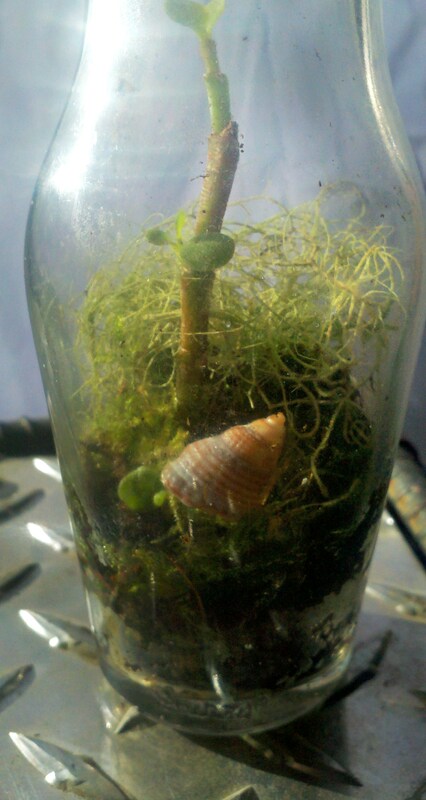 for every square inch of moss in your jar, add a quarter teaspoon of water. To take care of these, you’ll have to keep them in partial shade. In direct sun, the moss will get more green- so if yours begins to get brown, give it a day of direct sun, or a few days of indirect. If you keep it in direct sun it may dehydrate though, or even boil. If the water condensation is heavy enough to cover ALL the glass, open the lid and let it air out for a few hours. Don’t keep these near a heater- moss likes cool, damp, shady places. Maintenance is another how-to, but basically after about six-ten months, or if any one plant begins to dominate, open the jar, let it air out for a day. then add your original water amount again, and prune anything that needs pruning, then re-seal it. These are so fun to make. 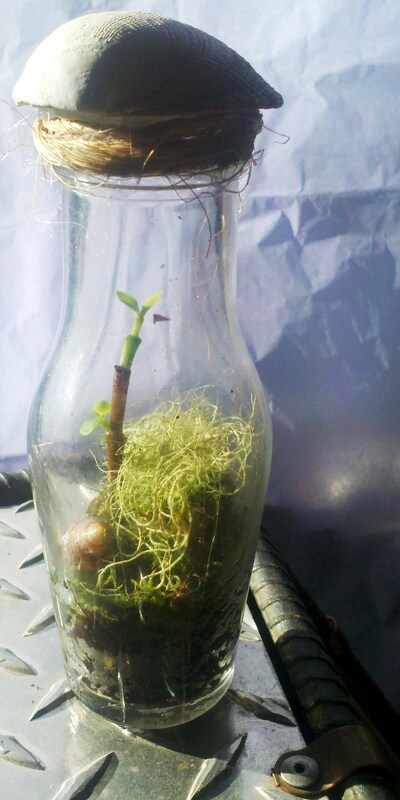 I live in a place where everything is growing; the moss jars I build are small versions of the woods where I live. If you want jars that look like the northwest, but you live elsewhere, you can buy moss jars premade from local people- or you can go out into your own backyard, and find moss that is local to you to grow! In desert areas, you can make cactus jars (no water, different substrate). These are great to bring to the office, so you have a little bit of the wild next to you while you’re stuck at work. If you make one of these, post a link to any pictures you get in the comments here! I love seeing how other people do things, and what they made.